Hey hey giveaway time my friends! Let's celebrate my 100th sale on Etsy! So the lucky winner will receive the Spring garden Gigi purse ($42), with free shipping of course! To enter: leave a comment telling me which is your favourite item from my shop and what is your favourite fairy tale (yes I was inspired by my last post !). Sorry, you need to answer those2 questions for your entry to be valid! For an additional entry,you can either twitter, facebook, or blog about this giveaway and come back here and comment with the link. And for another extra entry, just follow this blog in clicking the "follow" box on the right and write about it in a new comment. The giveaway will end Saturday, January 30th at midnight GMT and I'll pick a winner the following day. Now what about my favourite fairy tale? I would say that Cinderella participated to my dream of becoming a fashion Designer, and I was completely fascinated by the Fairy with Turquoise Hair in Pinocchio so I'd say they are both my favourites... Of course, if you count Alice's Adventures in Wonderland as a fairy tale, then IT is my favourite!!! Pour célébrer ma 100e vente sur Etsy, j'organise un petit concours dont le prix est le porte-monnaie ci-dessus. Écrire un commentaire en me disant quel est votre article préféré dans ma boutique ainsi que votre conte de fée préféré. Pour des entrées additionnelles: écrire sur ce concours sur votr blog, compte facebook ou compte twitter, et/ou s'inscrire sur mon blog avec l'icône "follow" à droite. Voilou! Quant à moi, je n'ai pas un conte de fée préféré, je dois avouer... Autant Cendrillon me faisait rêver de devenir Styliste ou Costumière, autant j'étais fascinée par la Fée aux cheveux bleus dans Pinocchio... Mais si on compte Alice aux Pays des Merveilles comme un conte de fée, alors là, c'est celui-la mon préfèré!! T'as raison, je suis vilaine:) Voila, c'est rectifie!!! Wow! I'd love to get that purse lol! I've been saving for the Magnolia clutches, for it is my favourite of your design!!! Bold Peacock Gigi Small Purse is my fave! The Boy Who Cried Wolf is definitely one of my fave fairy tales of all time! Silver Circles Medium Lili Clutch is my favorite. I love it's chic style and classic color. My favorite fairytale is Sleeping Beauty. The Arabesque Small Gigi bag is just beautiful!! My favorite fairy tale is the The Swan Princess. Thank you for the entry! My fave item is the Red maze Ambrosia---Luxury tie silk and leather large clutch bag with chain--2 internal pockets. And Sleeping Beauty is my favorite fairy tale. Hello! My favorite item in your shop is the Electric blue Gigi purse! Love the color. The Amber floral clutch is beautiful! And Beauty and the Beast is my favorite fairy tale. All your designs are incredible. The Spring Garden is one of my many favorites. As for a fairy tale, Sleeping Beauty always stands out for me. :) and my favorite fairytale is Cinderella! I love the summer sunshine Luxury silk Gigi purse! The color is beautiful! I love the Summer garden---luxury jacquard and leather clutch bag! and my favorite fairy tale has always been snow white! I love your Pink and gold silk floral Gigi purse. The fabric is so yummy!! My least favorite fairytale is Rumpelstiltskin. It always felt creepy to me as a child! A day in the countryside---Luxury floral medium Lili clutch. Although I love the spring garden also. favorite fairy tale. I would have to say Beauty and the Beast. I love the Sweet pillowy Gigi small purse! And my favorite fairy tale has always been The Beauty and the Beast. Green floral Ambrosia because I have a couple tops and scarves that would be complimented. Oh yes my fave fary tail is the one about snow white!!! I love the adorable strawberries on the Yummy strawberry Gigi purse. I haven't read too many fairy-tales but a boy asked me out in kindergarten after we played Snow White and he was the prince. Big fun of your shop! I love the midnight garden clutch. And my favorite fairy tale is Cinderella. Thanks for the giveaway! i adore the Japanese Flowers Gigi Purse. my fave fairy tale would be Cinderella! I love your contrast shoulder bag - the colors and textures are marvelous. I love the Golden arabesque clutch! I love the Victorian Medium Lili bag! Does Alice in Wonderland count as a fairy tale? your neon pink with bow is my favorite item in your shop at the moment - so vibrant and happy! my favorite fairy tale has to be this really strange Grimms Fairy tale about a Sausage, a Bird and a Mouse (http://www.authorama.com/grimms-fairy-tales-20.html) because it has to be the strangest thing i ever read in a fairy tale book! I like the "Butterfly Medium Lili Clutch," and my favorite fairy tale is probably tales about selkies, like in the movie "The secret of roan inish." Beautiful bags! I especially like 'A day in the countryside'. My fave fairy tale is 'the three little pigs'! My favorite item is the Fuschia Aenomium Gigi Purse. It's simple, but very elegant! Silver garland---Luxury Medium Lili clutch is my favourite!!! My favourite fairytale probably would be Little red ridding hood!! Beautiful shop full of beautiful purses/ bags. It's hard to choose one, but this Summer Flowers really caught my attention. My favorite bag is Yummy strawberry Gigi purse. My favorite Fairy Tale has always been Rapunzel, and I actually have 42" long blonde hair. Seriously. I had a hard time choosing a favorite, but I really love the Pink and gold floral Ambrosia!!! I posted your giveaway to my facebook page. I LOVE Snow White! She's always been my favorite. I fell in love with Summer garden---luxury jacquard and leather clutch bag! I love your Contrast Ambrosia Clutch. A day in the countryside---Luxury floral medium Lili clutch was my favorite. Thanks for the wonderful giveaway. I love the Pink and gold floral Ambrosia---clutch bag with chain. My favorite fairytale..I guess is Little Red Riding Hood. Being a mom and reading these fairytales all over again to my children, has made me realize how violent and what terrible endings they have!! I love the Poudre Gigi Purse (http://www.etsy.com/view_listing.php?listing_id=33810963). I think that color is so feminine and beautiful. Black floral Gigi purse - c'est ma preferee et j'aime la conte du petite chaperon rouge. My favourite fairy tail would have to be the one about 'the little mermaid'. Like the original, I love anything with sea creatures! and my favourite purse would have to be 'a day in the countryside'! The Red Gigi Purse is my favorite. Favorite fairy tell..Beauty and the Beast. I love some many things in your shop, but my favorite is Festive Gigi purse in Orange. I love the sleeping beauty! http://www.etsy.com/view_listing.php?listing_id=37925871. I love the autumn purse pictured here--but I also love love love the spring one you are giving away. My fingers are crossed! My favorite fairy tale is Beauty and the Beast. I'm your newest follower--thank you! My favorite of your pieces is the Silver fireworks Ambrosia bag. My favorite fairy tale is the Norwegian tale of Buttercup. The Marigold Ambrosia---luxury silk tie silk and leather large clutch bag with chain strap--2 internal pockets is my favorite. As for my favorite fairy tale.. it's gotta be Cinderella! Hi! I love the summer flowers luxury clutch bag! What beautiful bags! 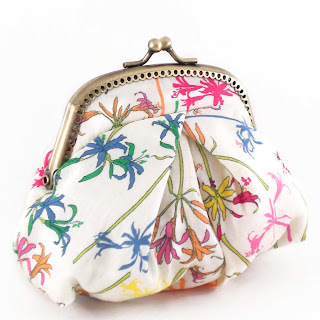 I love the Floral bouquet---Liberty silk Lili medium clutch. And my favourite fairy tale is Cinderella. My favorite is Butterfly Medium Lili Clutch! Fave item is the Cream and gold floral embroidery Ambrosia---luxury silk and leather large clutch bag with chain--2 internal pockets! Lovely material and design! Fave fairy tale is definitely Sleeping Beauty!! J'en reviens pas de l'affluence!! bouhh j'arrive après la tempète!! Et pour les contes de fées, je ne sais pas si ça vaut pour conte de "fée" mais j'aime bcp les contes de l'oiseau de feu avec princesse coincée dans des tours et vilaines sorcières!! A day in the countryside is gorgeous! I like the Fuschia Aenomium Gigi Purse. My favorite fairy tale is snow white and the seven dwarfs. I really like the Golden arabesque---luxury silk/cashmere medium clutch with chain-- internal pocket. Fave fairy take would be Mulan. I like the Summer garden---luxury jacquard and leather clutch bag. ah! lovely shop! I adore the bold peacock medium lili clutch. My favorite item is the deep purple gigi purse!! Love it! My favorite fairy tale is Cinderella of course! Every little girl dreams of being a princess! My favorite item is absolutely the Wimbledon Gigi Small Purse. so cute! I love the Happy Bloom Medium Lili Clutch, such a pretty pink! My fav fairy tale has to be Beauty and the Beast, I am a sucker for love stories! Thanks! Wow! All beautiful! My favorite is the A day in the countryside---Luxury floral medium Lili clutch! The pattern is gorgeous!~! I'm a follower - and my favorite fairy tale is Cinderella. I love the Azulejos Lili clutch---Printed cotton Medium clutch! The print is cute! I am in love with the soft peacock gigi purse... love red and love a good peacock print. congratulations on the 100th sale and thanks for the giveaway! I love the Purple Flower Printed Cotton Medium Lili Clutch. I love the yummy strawberry gigi purse! Love the Festive Gigi purse in Orange! And I would say that "The Little Match Girl" is my favorite. It is very sad, but I have always loved it. I love Beauty and the Beast the most! I like the autumn forest small gigi purse! it's so pretty :) and my favorite fairy tale is cinderella! My favorite fairytale has to be sleeping beauty. I like Midnight Blue Gigi Purse and many others too. I really liked A day in the countryside---Luxury floral medium Lili clutch. I adore your Summer flowers---luxury jacquard medium clutch bag! Its light, its free, whimsical and magical looking! My favourite fairy tale was Snow White! I love this purse. And I love the giveaway purse. What a generous giveaway. And I'm a happy follower now too. My favourite fairytale was always Snow White. The way she fixed up the house of the seven dwarfs, always appealed to me. My favourite item is the "Red and green floral Gigi purse"!! And my favourite fairy tale is Pinocchio...I'm italian!!!! harder to pick a favorite bag! am now a blog follower! I love both the Bouquet Gigi Purse and the Art Nouveau Lili clutch. They are beautiful. As a child I found fairytales rather horrifiyng and scary so I prefered tales like The Elves and the Shoemaker. My favorite item in your Etsy shop is the Yummy strawberry Gigi purse! Soo cute/elegant at the same time! I love the Summer flowers---luxury jacquard medium clutch bag. My favorite item is the Arabesque Gigi small purse, and my favorite tale is Cinderella. I love your bags! My favorite is the Dreamy Lili Clutch. My fondest fairytale is Snow White & the Seven Dwarfs . I'm a follower. Thank you. I like the Japanese Flowers Gigi Purse, so pretty! My favorite fairy tale has got to be The Swan Princess. Thanks for the giveaway. My favorite fairy tale is Beauty and the Beast, and my favorite item is Pink and gold silk floral Gigi purse. I love the bold peacock gigi! my favorite fairytale is snow white. I am followin you on twitter @sherieannb. Well done on your 100th sale. Azulejos Gigi small purse, it's my favorite color!!!!! Well, my favorite STORY is a true one, does that count? I love the story of Hadassa(Queen Ester) I love how God used an ordinary girl to become queen and save her people! Congrats on your 100th sale! That's quite an achievement. Cream and gold floral embroidery Ambrosia. It's so beautiful and elegant! I'm now a proud follower! Hi! Congrats on you 100th sale! You are very talented so I´m sure you´ll be very far from that soon! That fabric looks so fantastic on that model!!! My favourite fairy tale is Thumbelina - there's just something about the tiny girl who married a flower prince, loved it so much as a child! And I love the Summer flowers---luxury jacquard medium clutch bag - very pretty. i love the autumn forest gigi purse and my favorite fairy tale is the princess and the pea!! i love the A day in the countryside---Luxury floral medium Lili clutch and my fave fairy tale is Sleeping Beauty! Fuschia Aenomium Gigi Purse is my absolute fav. Didn't realise so many other love my favourite fairy tale of The Princess and the pea, still when I can't sleep I think aboout this story! My favorite fairytale would have to be Snow White! My favorite bag is the Floral bouquet---Liberty silk Lili medium clutch. My favorite fairy tale is the tale of Ali Baba and the 40 thieves from the 'Arabian Nights' collection of tales. A true classic! I love the Butterfly Medium Lili Clutch! My favourite fairytale is Snow White, just love those cute dwarfs! Summer flowers---luxury jacquard medium clutch bag is my favorite! I love how simple but beautiful it is. I really like the Red Floral Gigi purse. My favorite Fairy Tale is Beauty and The Beast. I love the Cream and gold floral embroidery Ambrosia---luxury silk and leather large clutch bag with chain. My fave fairy tale is Snow White.